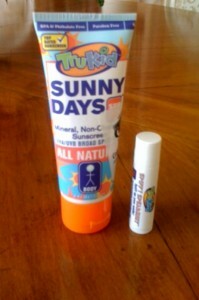 TruKid skincare company has sent us a bottle of their sunscreen and lip balm for our next giveaway. The sunscreen is called Sunny Days. It is a non chemical uva/uvb broad spectrum sunscreen. It does NOT contain Vitamin A, BPA, Phthalate, paraben, SLS, Gluten and 1-4 dioxane. It is All Natural. The lipbalm is pure and natural and is called Spiffy Spearmint. I think that the person who wins these products will love them. They also sent me samples of their shampoo, conditioner and body wash that I am going to review and let you know what I think of them. 2.Vote for us on Top Mommy Blogs by clicking the link to the left where it says Vote For Us. This Giveaway will end July 1st.